This page collects recent items on Copyright. My goal is Free Culture. Get a copy of the book by Lawrence Lessig to learn more. Where do you find new music? For many years, I listened to Sounds! on the Swiss national radio. I faintly remember not being able to download the podcast when I wasn’t in Switzerland. That really made me angry. Today I was listening to the Brahms symphonies. The recordings of the four symphonies I have are the only thing other than the German Requiem I have written by Brahms. I started wondering. Where to start? @fitheach and @ted recommended Musopen (”We provide recordings, sheet music, and textbooks to the public for free, without copyright restrictions. 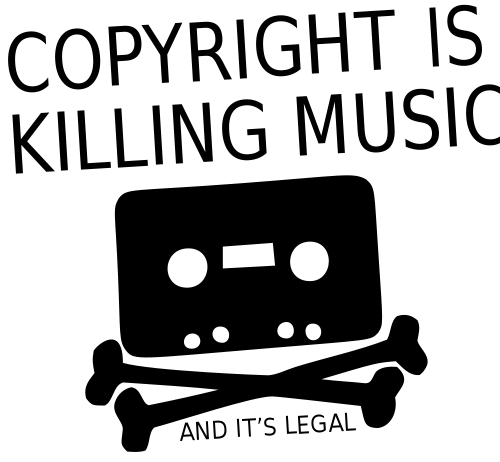 Put simply, our mission is to set music free.”) because they also have a music catalogue (”Royalty free music recordings”). Interesting. If you sign up for the free plan, you get five downloads per day. It doesn’t sound like much, but how much new music do you want to download every day? Perhaps that is enough. The next level is $55/year. It seems a bit expensive but perhaps only because I’m interested in the recordings and not the sheet music. That reminded me of Magnatunes. I think I bought an album or two from them many years ago. I listened to Ivan Ilić playing Brahms and Schumann for a bit. And perhaps $300 for their entire catalogue is a good deal? (That ad has interrupted my listening twice, now. Still better than the interruptions on YouTube, though.) I’d have ten years of listening for sure! Now I’m listening to La Reverie: Cantica. But $300! Wow. Then again, if I’d buy CDs, that’s just 10 CDs here in Switzerland. Surely I’ll find 10 good albums on Magnatunes. @xosem recommended IMSLP (the International Music Score Library Project): “The ultimate goal of the IMSLP is to gather all public domain music scores, in addition to the music scores of all contemporary composers (or their estates) who wish to release them to the public free of charge.” The site also has recordings, however. The first symphony, for example, has a recording from the Swiss national radio, 1962, and from the University of Chicago Orchestra, 2006. Very cool! Anyway, @fitheach recommended the violin concerto opus 77 and @cerisara recommended the hungarian dances. @cerisara also recommended Brahm’s clarinet quintet . @wrenpile recommended the two serenades, Serenade No. 1 in D major for orchestra and Serenade No. 2 in A, Op. 16 and provided two YouTube links to recordings by Istvan Kertesz  and he recommended Sonata for Piano and Violin No.1 in G major, op. 78 by Kremer and Afanassiyev  “For sheer molten gorgeousness”. All right! I’m looking forward to this. Remember the beauty of youtube-dl --extract-audio --audio-format mp3 URL! See 2016-12-20 Extract YouTube Audio for more. @Masek wrote a long post on the upcoming upload filter legislation for the European Union, Copyright 13. We are approaching the endgame and this is not the MCU. Within a few weeks one of the worst pieces of legislation I’ve ever seen will be passed by the EU parliament. So I will kick off a small series of short articles about what we’re fighting for and against, why we are fighting it and who are our opponents. This is the feedback I provided after reading Protect freedom on radio devices: raise your voice today! More information is available from the FSFE, EU Radio Lockdown Directive. I’d like to give some feedback on Article 3(3)(i) of the Radio Equipment Directive 2014/53/EU. The passage “to ensure that software can only be loaded into the radio equipment where the compliance of the combination of the radio equipment and software has been demonstrated” is going too far. I recently saw a post by @emsenn, talking about the music business. What caught my eye was the note that less piracy does not mean better pay for musicians. Don’t assume not pirating has improved things for musicians. So, gotta pay ~$780 a year to be able to (with good protection) submit your songs to spotify and such. That’s more than 111k Spotify plays to break even on membership fees ... assuming you get all the money yourself, but in practice usually 25% is eaten by other intersts, so we’re up to 138k plays. Again, that’s assuming you didn’t pay anything for your instruments, training, recording, or production, and that you aren’t paying yourself: 138,000 listens to not lose money sharing your music. So, it’s real cool that folk can stream music at such low cost to themselves. But I don’t want anyone to ignore the effect that’ll have on folks’ incomes. And also, think about the effect this might have on musicians and the art they produce, when they’ve got to hit such high goals in order to break-even. They’ll be more inclined to make music that ends up on playlists, since that’s an easy way to boost listens. This isn’t just a fear: it’s already happening. It’s a weird place to be in: thanks to technology, anyone can record, produce, and distribute music cheaper than at all point in history. But... thanks to technology, you need to do all that to produce music, if you don’t wanna get slapped by a record label, and because of the tie-in with labels and the law, it’s not actually as cheap as it could be. So in reality, it’s very cheap to make music, very cheap to receive music, but very expensive to distribute it, and that’s... weird. In 2018 my music was listened to on Spotify for 190k hours by 241,631 people. Those 2,252,293 streams netted me $12,231, which is 39.2% of my annual rent. If you love the music please consider going to a show or supporting my work directly at zoekeating.com. Thank you! So, how can independent artists, including Keating, survive the streaming music giant’s terrible payouts? Keating gives two solutions – attend artists’ shows and support their work directly. Rémi Rampin was not convinced. He said he wrote free software for a living and that he didn’t understand what the difference was supposed to be. I linked to Why Open Source misses the point of Free Software by Richard Stallman, but Rémi Rampin argued that the difference between the two terms was minimal and that both the people and the discussions happening would not differ significantly as one list would be strictly included in the other. I suggested we test this by simply looking at the overlap between these two lists. Rémi Rampin found the following: 22 people are on both lists, 5 are only in the Free Software list, and 33 are only in the FLOSS list. I left it at that. The Open Source Initiative is a marketing program for free software. It’s a pitch for “free software” on solid pragmatic grounds rather than ideological tub-thumping. The winning substance has not changed, the losing attitude and symbolism have. Most hackers know that Free Software and Open Source are just two words for the same thing. Unfortunately, though, Open Source has de-emphasized the importance of the freedoms involved in Free Software. It’s time for us to fix that. Die Idioten haben wieder eine Schlacht gewonnen. Mehr hierzu auf Netzpolitik. Wer war auf unserer Seite? Die Piratin Julia Reda und alle Sorte von engagierten Menschen, Parlamentarier aller Lager, Wissenschaftler. Redas Statement gibt’s auf ihrem Blog. Und trotzdem: Der bescheuerte Vorschlag von Axel Voss (CDU) wurde mit 438 zu 226 Stimmen angenommen. Ich fasse einfach nicht, wie so viele Leute dafür sein konnten. Und was ist der nächste Schritt? Jean-Claude Juncker schlägt vor, bla bla bla Terrorbekämpfung bla bla Upload-Filterpflichten gegen „terroristische Inhalte“ bla bla bla. Kann man sich ja vorstellen. Naja, es gibt ja noch Rückzuggefechte: der genaue Text steht noch nicht fest. Die Mitglieder dürfen auch noch selber mitgestalten, und so weiter und so fort. Aber die Enttäuschung bleibt.